"I was in Santa Monica a few years ago, where I ordered a chicken Parmesan that featured a garlic, rosemary, and Marsala-spiked sauce. I loved the subtle sweetness the wine added to the tomato. For whatever reason, I thought of those flavors while brainstorming a quick skirt steak marinade, and this is what happened. Skirt steak is always great on the grill and doesn't need much help, but I love how this came out." Whisk Marsala wine, ketchup, garlic, kosher salt, rosemary, and black pepper together in a large glass or ceramic bowl. Add skirt steak and turn to evenly coat. Cover the bowl with plastic wrap, and marinate in the refrigerator, 8 hours to overnight. 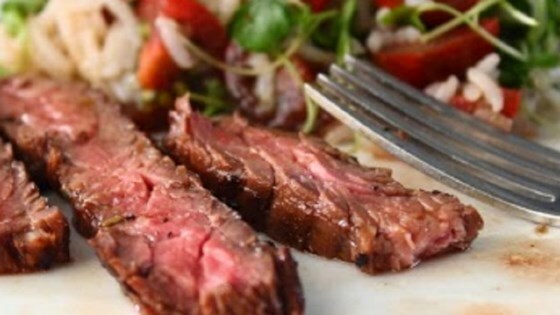 See how to make grilled skirt steaks marinated with slightly sweet Marsala wine. You can substitute 1 tablespoon fresh rosemary for the dried rosemary. Excellent marinade! I've used it for both skirt steak and flank steak. Grilled very rare. Heated leftover marinade and poured over sliced steak.